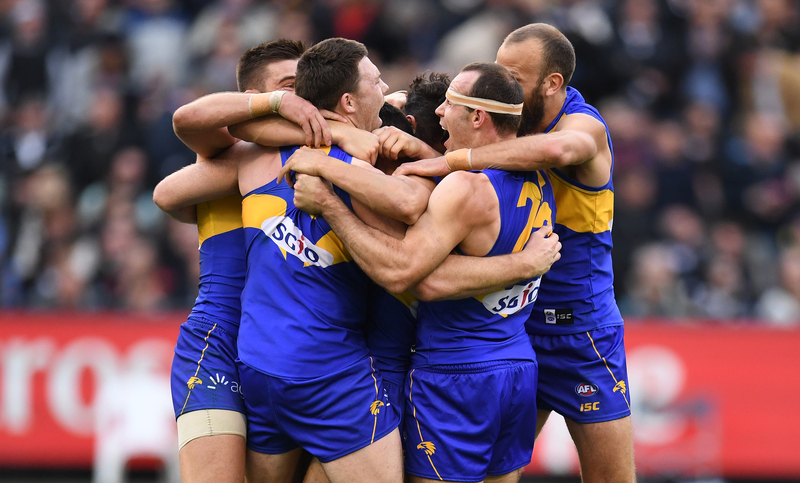 The Eagles rallied from 29 points down late in the first quarter, and then two goals behind early in the last, to win 11.13 (79) to 11.8 (74) and claim their fourth premiership in front of 100,022 fans at the MCG. Saturday’s belter of a grand final was the closest since the 2010 draw between Collingwood and St Kilda. West Coast led for only nine minutes, but it was enough to exorcise the demons of the 2015 grand final shocker against Hawthorn. With scores level at three-quarter time, Eagles coach Adam Simpson had a simple message for his players. “We’ve been having a bit of a theme about head, heart and gut,” he said. “The heart’s the love of the game, we all love this game, and the gut is about the last quarter. It is Simpson’s first flag as a coach and he is the third-straight former Alastair Clarkson assistant from Hawthorn to take his own team to a premiership, following Luke Beveridge (Western Bulldogs) and Damien Hardwick (Richmond). Luke Shuey won the Norm Smith Medal as best afield, racking up 34 disposals and eight clearances as well as a game-high 19 contested possessions. With two minutes left and Collingwood leading by two points, a towering Jeremy McGovern grab in defence led to a big mark on the wing by Liam Ryan, who found Dom Sheed deep in a forward pocket. Sheed nearly played on, but the Eagles onballer went back and calmly drop-punted the match-winning goal. In the frenetic moments that followed, Eagles forward Jack Darling dropped a sitter of a mark in their goalsquare. But it did not matter – the ball was rushed through for a behind and Shuey then took the relieving mark that sealed victory. It was an echo of Darling’s woeful dropped mark in the 2015 grand final, and indeed the Eagles could have been forgiven for fearing history was repeating itself, with both their attacking spearheads – Darling and Josh Kennedy – having moments to forget as Collingwood romped to an early 29-point lead. Kennedy missed a set shot he would usually gobble up with the first scoring attempt of the match against the Pies, then got in Daniel Venables’ way for what should have been an easy mark right in front of goal. “I missed that first one and then they kicked five in a row… I was thinking ‘Oh no, here we go again’,” Kennedy said. “But it was a great fight back by the boys, great resilience. “We were in that position a few years back and we didn’t handle it very well. Kennedy finished with three goals, 18 possessions and 11 marks. Darling’s entire first half was nothing short of disastrous. The key forward wasn’t a factor with just three touches but roared to life after the break to be instrumental in the third quarter with six marks and goal. “I just had to stick at it for four quarters… as a forward it doesn’t always go your way,” Darling said. “It was good to get a few marks… I ended up doing ok.
“It’s much better being on the other side (after 2015). I knew we were much more prepared for this. 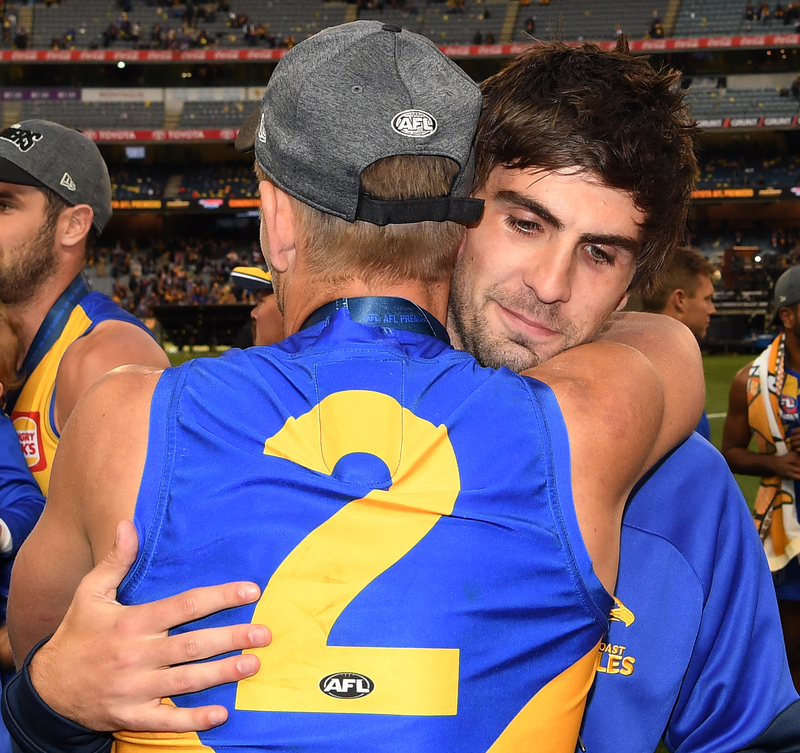 Darling’s third-quarter flub in the 2015 premiership decider came to encapsulate West Coast’s bad day at the office, but he was philosophical about missing the chance to ice Saturday’s game soon after Sheed’s stunning goal. “I did drop a mark there but thankfully the damage was done,” he said with a wry smile. “I wasn’t worried about taking the mark… I was focused on what I was going to do with the ball. The last term was full of high drama, with West Coast missing a string of scoring chances. West Coast overcame the loss of star players Nic Naitanui (knee reconstruction) and Andrew Gaff (suspension) this season while the flag comes a year after Simpson was under pressure to keep his job. Kennedy and the Magpies’ Jordan De Goey kicked three goals apiece, while Taylor Adams and Tom Langdon were best for Collingwood. The Magpies were as shattered as the Eagles were jubilant. Collingwood coach Nathan Buckley spent several minutes post-match conforting team runner Alex Woodward. The former Hawthorn player collided with Jaidyn Stephenson at 20 minute in the third term, enabling Elliot Yeo to take an uncontested mark. Yeo goalled to put the Eagles in front for the first time since early in the first quarter. Buckley, like Simpson, felt numb post-match. “Everyone that is saying ‘well done’ is having to sort of put a rider on it because we didn’t get the result,” Buckley said. It is the latest chapter in the Magpies’ torturous history of grand final near-misses. But they lost no friends on Saturday. They have been outstanding after finishing 13th last season, when Buckley came close to losing his job. And the coach believes the love and care shown by his players for each other can help them overcome the shattering five-point loss. But, he says, it’s not a given. “The people who represent our club have been enormous,” Buckley said. “I have a great deal of pride for our organisation and the way we carry ourselves and the way we conduct our business. 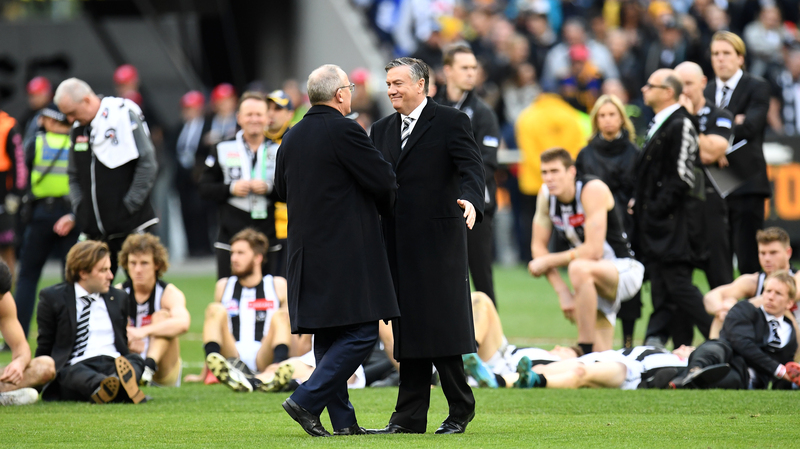 Buckley challenged his players to face the reality of their missed opportunity – the Magpies led for all but nine minutes of the grand final. “We have to face this reality, and then how we respond to this reality,” he said. “It won’t be for lack of support. It won’t be for lack of love or care for each other. “But that needs to be something that is continually digged into and never taken for granted. It’s finite unless you keep producing it. “So that is going to be a big challenge for us. “But I have got no doubt that that has become us and become part of our personality and who we are.